Reconnection and commercialization met on 18-20 October when Dr Moctar Touré from Senegal, and Mr Birama Sidibé from Mali, long-time friends of IITA DG Nteranya Sanginga, visited Ibadan to initiate a partnership-support relationship with the Institute that would benefit many start-up businesses in Africa. DG Sanginga welcoming his old friends. The duo were warmly received by DG Sanginga, who gleefully welcomed his old friend Touré, with whom he had interacted in the past around African agricultural research for development. “I am very pleased to see you again after a long time, and knowing that you want to partner with IITA as a private sector actor is delightful news. 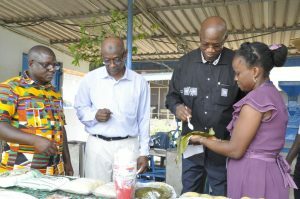 Your interest is clearly in line with IITA’s vision in terms of engaging the private sector and extending the products of IITA research to the end users,” said DG Sanginga. Corroborating DG Sanginga’s stance, Mr Sidibé said IITA has helped many private sector organizations grow. “There is only one door to knock on for opportunities, technical excellence, and high technology: IITA’s door. We are pleased with the leadership vision here and seek a strategic partnership, mentorship, and training from IITA,” he said. Dr Touré expressed his aspiration for a win-win partnership with IITA. “It is important to note that we are looking for a win-win partnership with IITA, the sort of partnership that will open new doors and opportunities for many start-up businesses, similar to the one we are initiating back home,” he disclosed. The duo went on a tour around IITA that showcased various interventions and technologies. They described the tour as impressive and fascinating, and applauded DG Sanginga for the rapid growth of the Institute. 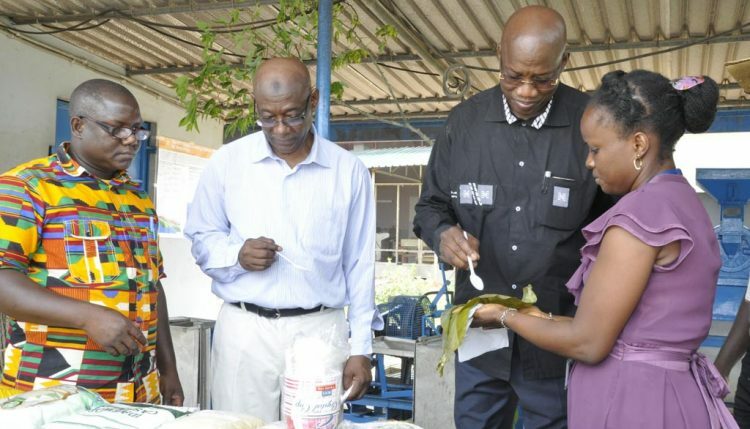 From (L-R ) Mr Sidibé and Dr Touré at the Cassava processing unit. Dr Touré is currently a member of the Senegalese National Academy of Sciences, the African Academy of Sciences, and the Global Science Academy. He was a former World Bank Executive and chair of the Africa Harvest’s Board of Directors. Mr Sidibé, on the other hand, is an executive of AGROBIOTECH (Bamako, Mali) and was a former Director of Shelter Africa, and former VP of the Islamic Development Bank. They are both engaged in setting up a commercial propagation tissue culture lab with the capacity to supply commercial farmers in the ECOWAS region with certified drought- and disease-resistant planting materials.